Captain America: The Winter Soldier is undoubtedly the best movie so far from Marvel’s “Phase II” as well as the best movie they’ve made not featuring Iron Man. The plot is essentially a mashup of All the President’s Men, The French Connection and your standard superhero movie, but somehow it works, even though the big action finish is disappointingly conventional after the plot twists of the first two acts (but that’s what the audience demands). While the first Captain America movie was a WWII adventure, this one smartly positions itself as a 70’s style political thriller. 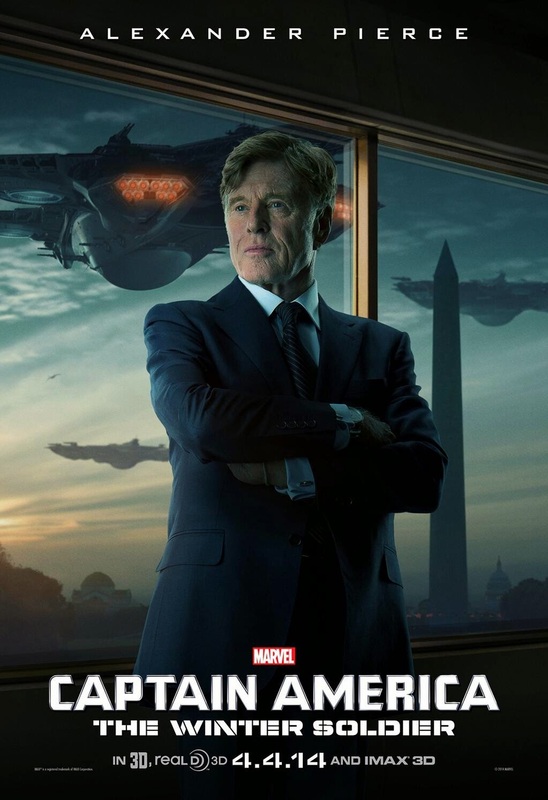 This is emphasized by the brilliant casting of Robert Redford (who would have made a good Steve Rogers himself early in his career) as Alexander Pierce, a senior member of SHIELD who is not what he seems. The film opens with Rogers still adjusting to missing almost 70 years of history. This is pretty much summed up by the amusing scene where Cap meets ex-military Sam Wilson who suggests he add the Troubleman soundtrack to his list of things he needs to catch up on. There’s also a poignant scene where he visits the aged Peggy Carter in hospital, who is now suffering from Alzheimer’s. Aside from the opening action scene (where Cap has plenty of flirtatious banter with Black Widow) the plot really kicks in when Nick Fury decides to halt a mysterious new SHIELD project, leading to an attempt on his life and an exciting car chase. The subsequent "death" of the character we've come to know over six movies is actually quite moving, though it's not a huge surprise that he turns up alive and mostly well later in the movie. The film has some interesting things to say about our current level of surveillance and the moral implications of wiping out enemies before they even attack. Though the true patriot Cap going rogue and standing up for freedom against his superiors would have more weight if the villains actually were trying to make the world a better place in their own way, and not just HYDRA infiltrating SHIELD (“Hail Hydra" has become a huge meme). But it’s hard to complain about the movie opting for a more simplistic view of things in the last act when the first two thirds are so well done. The action is intense and satisfyingly brutal for a PG-13 movie. All of the actors come off well, with Scarlett Johansson and Samuel L Jackson both being given more to do than even in The Avengers. Anthony Mackie makes a welcome addition as the Falcon, Sebastian Stan make a good if underwritten villain and you even get to see Jenny Agutter kick arse (watch the movie to find out how). The ending made me anxious to see not just Avengers: Age of Ultron (watch for a mid-credits cameo by the "twins") but also Captain America 3. Who cares about Batman vs. Superman?